Melbourne-based artist Ronnie van Hout was born in Christchurch in 1962. He attended the School of Fine Arts at Canterbury University between 1980 and 1982, where he majored in film. Since the early 1980s van Hout has exhibited regularly in New Zealand and Australia, and has been included in several group shows in the USA and Europe. Encompassing sculpture, painting, photography, video and embroidery, the work of van Hout offers a wonderfully macabre exploration of the self. It is at once shamelessly personal, often incorporating images and documents relating to the artist, and universally affective, using a dark twisted wit to bring the absurdity of our existence into keen focus. 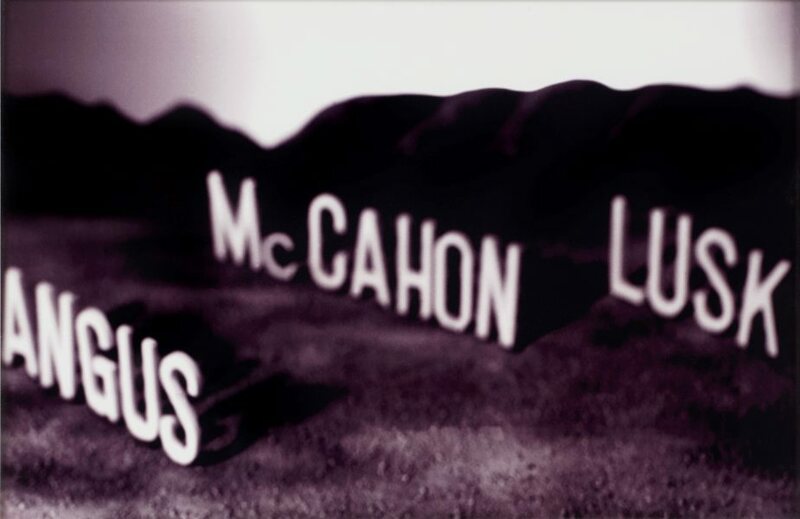 In ‘Angus McCahon Lusk’ 1992, van Hout has constructed the surnames of celebrated New Zealand modernists Rita Angus, Colin McCahon and Doris Lusk from small scale 3D models and photographed them in a strange, barren landscape. With a nod to the infamous icon of ambition and success, the Hollywood sign, the work pays homage to the landmark names of New Zealand art, but does so with van Hout’s characteristic cheek. The comedic overtones of the photograph’s B-grade horror film setting suggests the modern traditions of a ‘truly’ New Zealand art were not something van Hout sought to pursue. As the artist has remarked, “I can’t fulfil the promise of the previous generations…So I am going to do silly, not silly, small things, small acts.” The work also tells of the changing sensibilities and shifting ideas that were emerging in New Zealand contemporary art in the 1990s, in particular to what Robert Leonard refers to as the “Gothic turn” witnessed amongst the work of Pakeha artists at the time. Signed and dated bot c. verso [on trim], pen "Ronnie van Hout...1992". Ronnie van Hout: I've abandoned me , Dunedin, 2003, 26, 27 (colour illus. ).